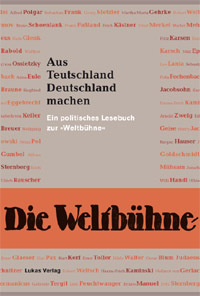 The use of the word militarism has become silted up, on both the left and the right of the political spectrum in Germany. Whether a state has military power or not, and whether it makes liberal or little use of it, is entirely beside the point. It only matters whether it uses it intelligently, whether it fits in comfortably as an intellectually controlled element of the social and policy context. Military power is not a problem. The only problem is its relationship to the intellectual power which it serves. Physical force and intellect are not necessarily opposed to one another, but the physical force should be the servant, and the intellect the master. Any shift towards the reversal of this relationship is a mortal danger. Militarism is a disturbed relationship, so any use of the word which only refers to one of the elements of the relationship, is false. Germany was not ruined by its actual military power, it was ruined by a lack of intellectual power. This entry was posted in 1922, Die Weltbühne. Bookmark the permalink.